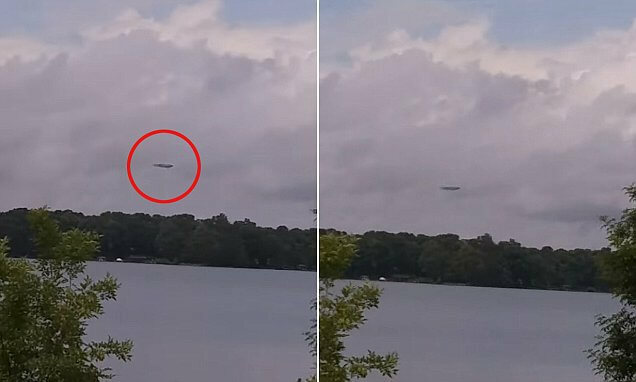 A video of an object hoovering eerily over North Carolina’s Lake Norman has UFO enthusiasts eager to deduce we are being visited by extraterrestrial beings, but perhaps there is a more grounded explanation. The footage recorded by Jason Swing on May 29, is extremely shaky but when the video isn’t bouncing up and down it shows, clear as day, a large object that appears to be hovering in mid-air. During the short clip Swing posted to YouTube he announces ‘This is a spacecraft.’ The clip is accompanied with a brief explainer of the video. The video has garnered over 150,000 views and then it received an additional boost in viewers when on Thursday the YouTube video channel ‘The Hidden Underbelly 2.0,’ a site focused on UFO and creature videos picked it up. While some people were excited about the possibility of the large object being a UFO, others wondered if the government was behind the large flying object. And yet others were more realistic with their guess as to what this flying object could be, with some people, likely accurately guessing, it was the GoodYear Blimp. GoodYear saw the video, and claims, as much as some wish it were a UFO, that the object seen in the shaky footage, is there blimp that was in the the Charlotte area on May 29, for NASCAR’s Coca Cola 600. North Carolina is also the home to multiple military bases, including Fort Bragg, Pope Air Force Base and Camp Lejeune Marine Corps facility. The state is in the top 10 for ‘UFO’ sightings.